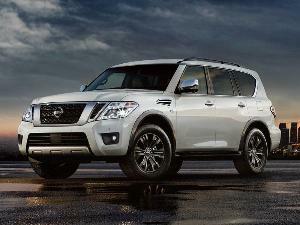 The aptly named Armada is Nissan’s largest and most capable sport-utility vehicle. 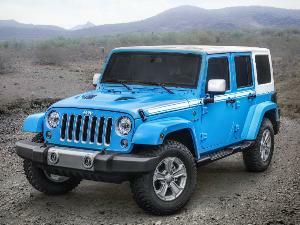 It’ll carry seven or eight passengers and tow trailered loads up to 8,500 pounds. In a market teeming with car-based mid-size and compact crossovers, the full-size Armada stands out. Its body-on-frame construction is a bit of a throwback to the time when SUVs were based on pickup trucks and built to handle the rigors of off-road trails. 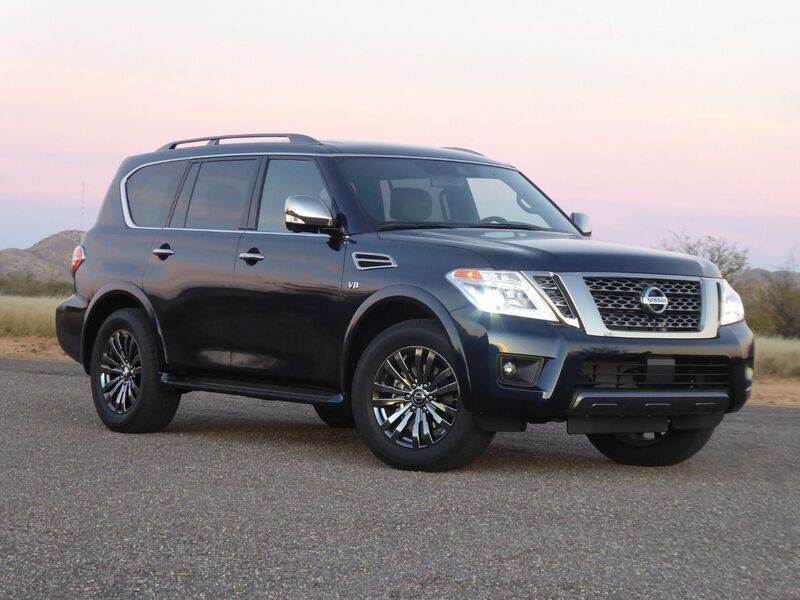 But one look at the fitments and comfort and convenience content of the 2019 Nissan Armada will convince that this mud-buster has gone uptown. The Armada belongs to a small group of competitors that include the Toyota Land Cruiser and Sequoia, Chevrolet Tahoe and Suburban, GMC Yukon, and Ford Expedition. And it’s the most expensive SUV in Nissan’s lineup, with the base SV priced at $48,495 (including the $1,395 destination charge), the midlevel SL at $53,295, the premium Platinum at $61,495, and the Infiniti-worthy Platinum Reserve at $64,495. 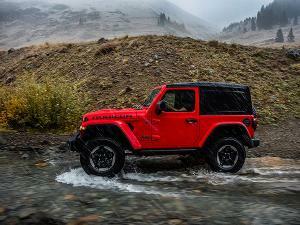 Add $3,000 to each for four-wheel drive. The Armada gets a full-size engine too, sticking with a time-proven, torque-rich naturally aspirated V8. It’s essentially the same direct-injected 5.6-liter dual-overhead-cam engine that lives under the hood of the Infiniti Q70 and QX80 and Nissan’s full-size Titan pickup, as well as its work-rated full-size NV commercial vans. In the Armada, it punches 390 horsepower and 394 lb-ft of velvety torque. 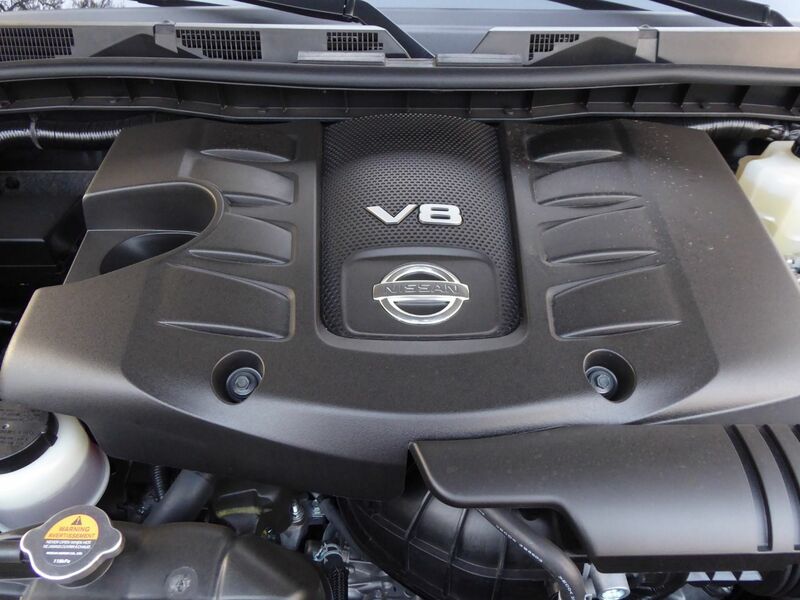 The big V8 has an authoritative exhaust note at wider throttle openings and a cool-as-a-cucumber muted rumble cruising around town. It just exudes confidence carrying all sort of loads and powering through a wide spectrum of driving situations as if to say, “yeah, I can handle that.” The smooth-shifting seven-speed automatic transmission includes synchronized rev matching and available driver manual shift control. EPA estimates won’t score points with the Sierra Club but are what you’d expect of a big, cushy V8-powered SUV with lots of capability: 14 mpg in the city and 19 mpg highway with rear-wheel drive and 1 mpg less with four-wheel drive. I saw 17.8 mpg in mostly highway driving. Its use of regular-grade fuel helps control costs. You only need to drive a few blocks to realize the Armada is a big, solid player. With robust body-on-frame construction, the near-three-ton Armada moves out with authority. 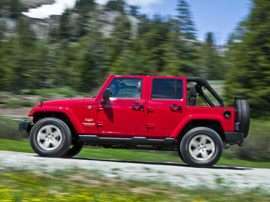 The four-wheel independent suspension delivers a firm but confident ride, and its old-school hydraulic power rack-and-pinion steering provides precise response and decent road feel. 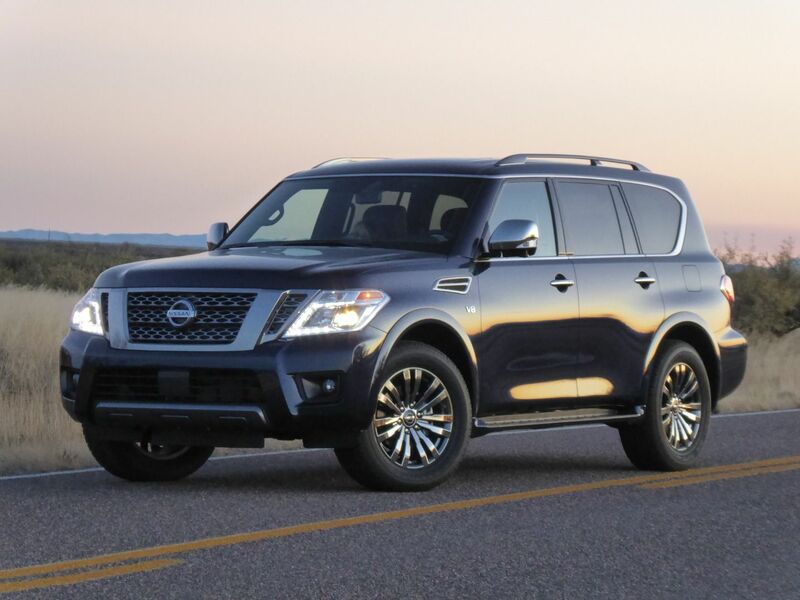 Large-diameter standard four-wheel disc brakes haul the big Armada down from speed with confidence. Even with the meaty 275/60R20 all-season tires standard on the SL and higher trims, impact harshness is never intrusive. Hill start assist is standard as are driver-selectable tow and snow modes that tailor transmission shift mapping via a console controller. Four-wheel-drive models have an automatic setting that chooses between two- and four-wheel drive based on available traction. There is also a dual-range transfer case with both 4WD High for dirt roads and 4WD Low mode for slow-going off-pavement excursions over rough terrain. 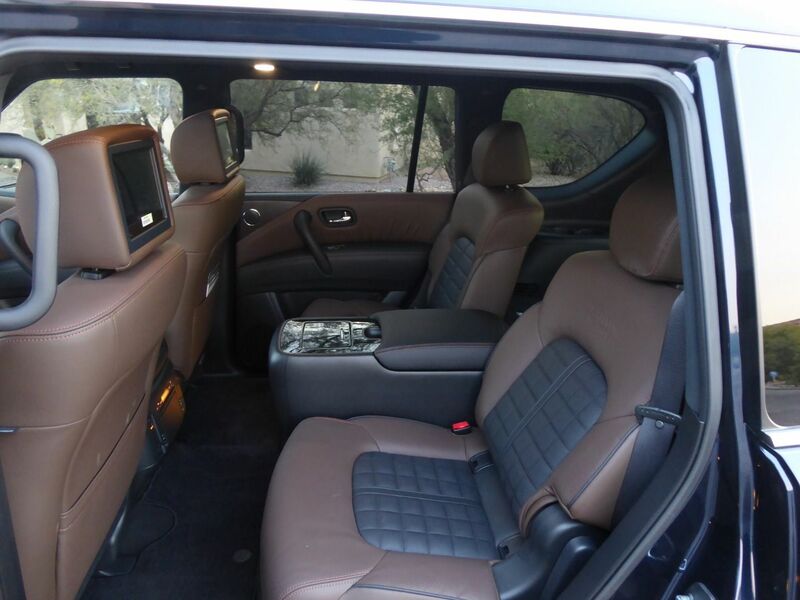 Climb up into the well-appointed cabin via the standard running boards and you’ll be riding tall in the saddle. Excellent soundproofing keeps things hushed inside, all the better to enjoy the standard 13-speaker Bose AM/FM/MP3/CD stereo with both HD radio and SiriusXM satellite radio. Bluetooth hands-free cellphone connectivity and a hands-free text-messaging assistant feature are onboard as well as intelligent full-range cruise control (new for 2019), a HomeLink garage-door opener, and push-button start. 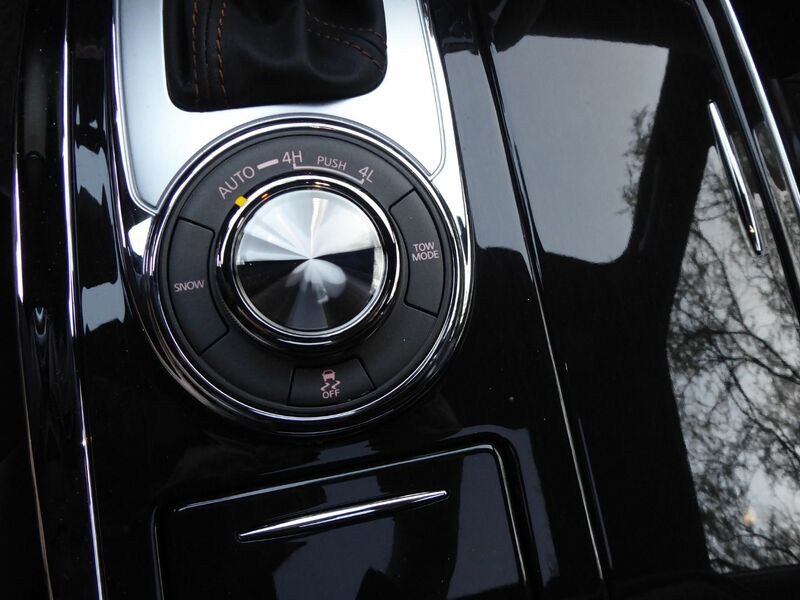 SL and higher trims also get remote engine start, a power tilt/telescopic steering wheel, and rain-sensing wipers. Another interesting Armada feature standard on Platinum and above is the Intelligent Rear View Mirror. It uses a hi-res camera at the rear to send an image to the in-car rearview mirror, which is now also a display monitor. The advantage is that the intelligent rearview mirror’s image of what behind the SUV won’t be obstructed by headrests, cargo, or rear passengers. 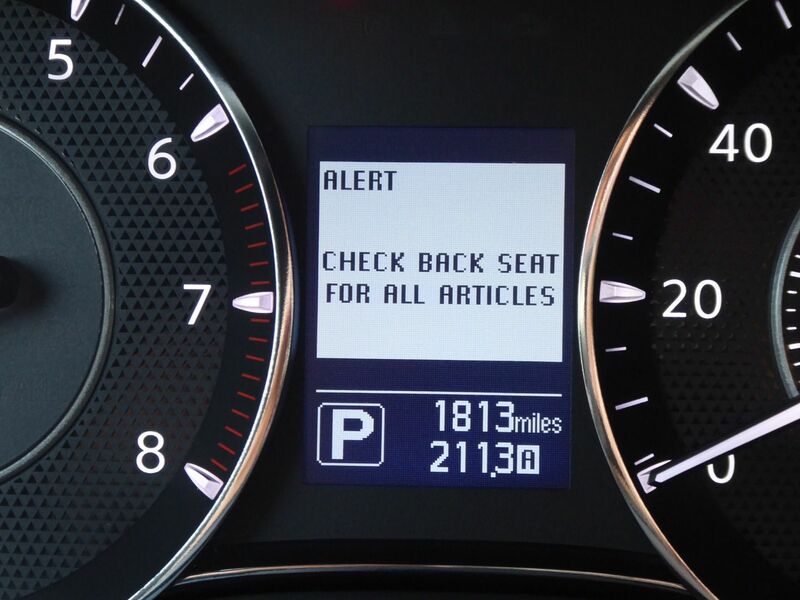 A tad on the dated side is the Armada’s infotainment setup. Especially in these days of 9-, 10-, even 12-inch screens in the newest systems of competitors, Armada’s classic 8-inch color display seems small, especially in such a generously sized vehicle. At least the standard navigation system is easy to operate with functions accessed via voice controls, touchscreen buttons, an iDrive-like twist, a flick-and-tap dash-mounted control wheel, and quick-key hard buttons. There are even traditional twist knobs for audio volume and tuning. SiriusXM Travel Link and Traffic are included, too. 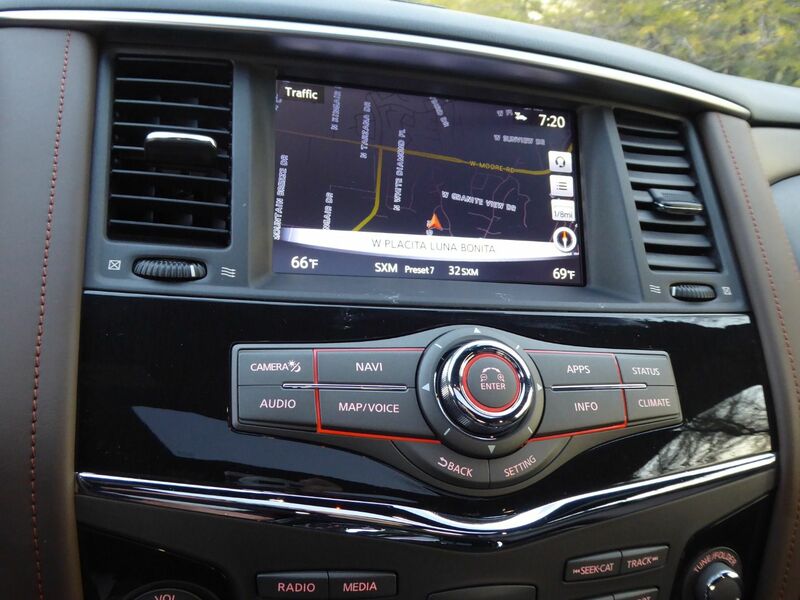 The only things missing are Apple CarPlay and Android Auto compatibility. 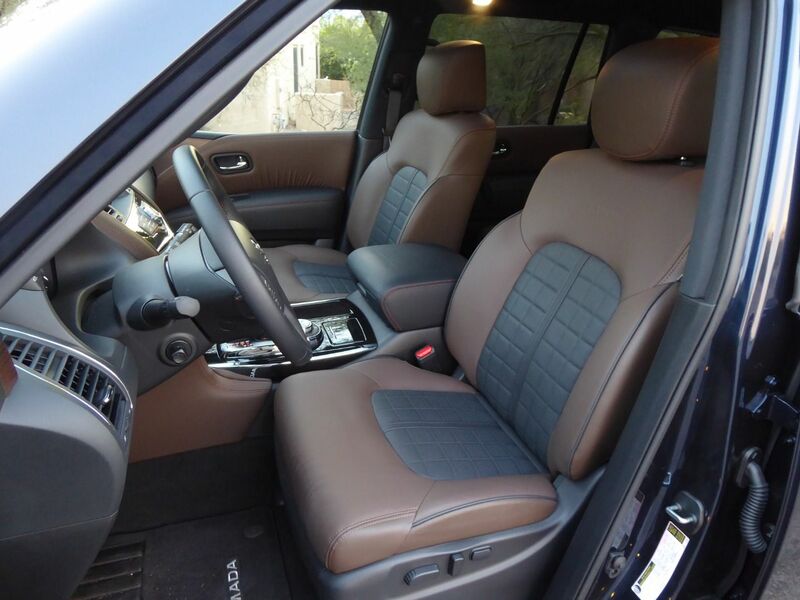 One thing’s for sure: The Armada’s standard front bucket seats are inviting. They’re power-operated and heated, of course, and come in a variety of coverings including cloth in the base SV model, soft leather in the SL and Platinum, and Infiniti-worthy two-tone leather in the Platinum Reserve shown above. Front seat cooling is added in Platinum and Platinum Reserve. The seats are immensely comfortable for short hops or extended sojourns, and they have the variable density foam that supports all those parts of your body that need it. 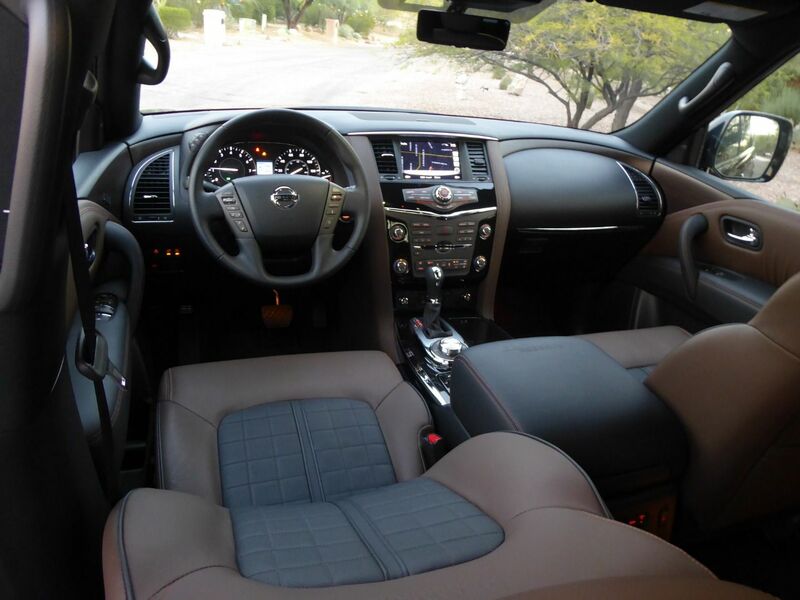 Nearly as roomy, comfortable, and inviting as the front seats are the Armada’s optional second-row captain’s chairs, available on all models but the base SV. Shown here in super-luxe two-tone Platinum Reserve trim, the package includes a padded center armrest and soft leather coverings. 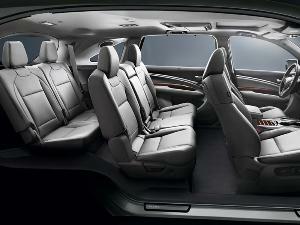 Both the individual rear captain's chairs and the base model’s three-across second-row bench seat can tip up to facilitate third-row access. They also slide fore and aft to accommodate varying passenger and cargo needs. The seatbacks recline for second-row sunroof gazing and fold flat to maximize cargo space. A rear-seat entertainment system, standard on the Platinum and Platinum Reserve, brings a pair of 7-inch hi-res displays on the rear of the front seatbacks, two wireless headphone sets, a remote controller, an HDMI jack, and two USB ports. Despite rumors to the contrary, Max Cargo was not one of the Pep Boys. 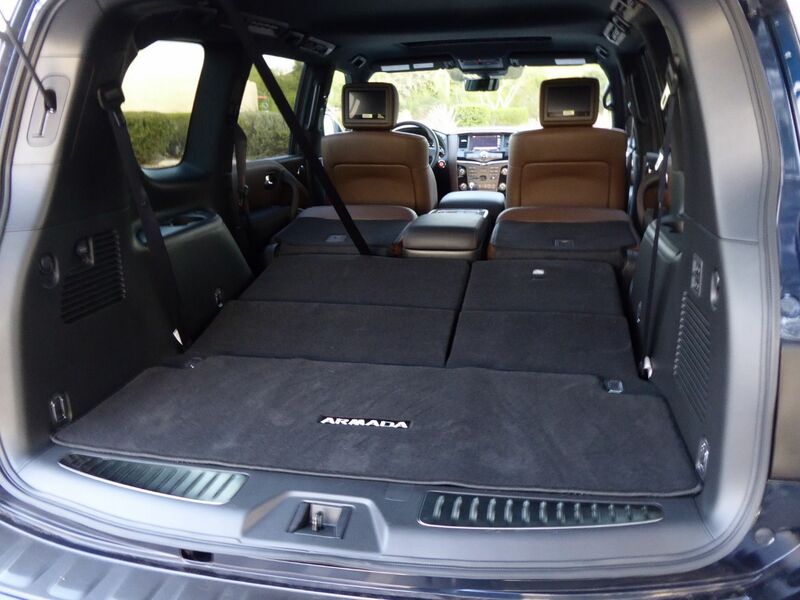 As you’d expect of a full-size SUV, the Armada can haul a lot of stuff — 95.4 cubic feet of it with the second- and third-row seats folded down. The resulting cargo space isn’t quite flat, as it ramps up toward the front of the vehicle but is low at the rear to facilitate easy loading. A power-operated liftgate grants easy access to the cargo area, and a pair of switches just inside the liftgate raise or lower the 60/40-split third-row seats. Drivers needn’t worry about a flat tire in a remote spot only a capable 4WD SUV could get to; a full-size spare tire is aboard under the cargo floor. New for 2019 is a standard Rear Door Alert system. It’s designed to prevent drivers from forgetting children, pets, wedding cakes, and other precious cargo in the back seats. If a rear door is opened before the trip and not opened again at its completion, a message will appear in the gauge panel and the horn will sound as a reminder to check back there. It can be turned off when not needed. 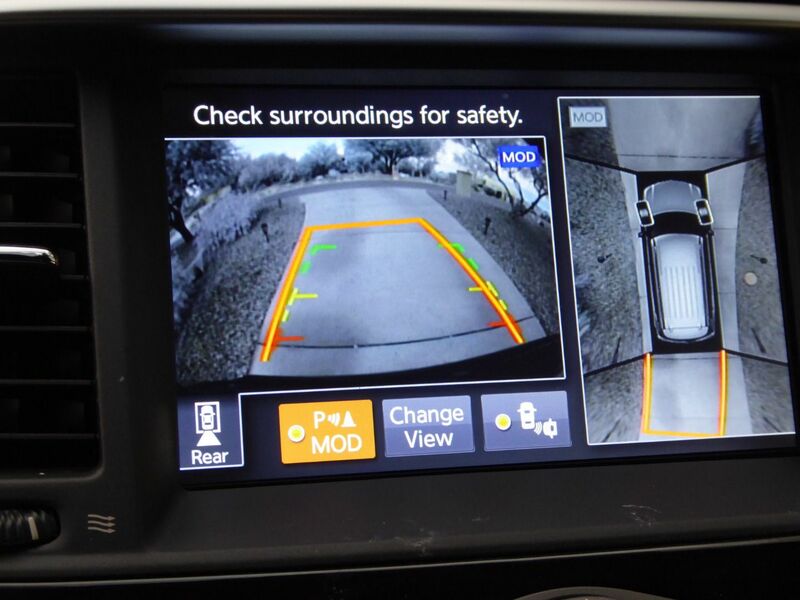 As with all new vehicles, the Armada comes with a standard backup camera. The Platinum and Platinum Reserve models take the further step of including Nissan's Around View Monitor. In addition to enabling the driver to select between telephoto and wide-angle views with displayed trajectory paths, this system provides a 360-degree overhead image of the SUV and its immediate surroundings. It does this by stitching together images from front and rear cameras plus ones in each side mirror. Another capability of the monitor is the ability to display a view of the area directly adjacent to the vehicle sides, along with any potential impact items. The Armada may not be the top choice for young city-dwellers or starting families on a tight budget. 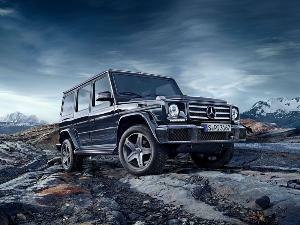 But for those buyers looking for an authentic full-size SUV with the muscle to handle up to eight passengers and trailers in the 8,500-lb range that sprinkles in just the right amount of luxury and bling, well, ta-da! It’s pretty easy on the eyes, too, and if your fuel budget can handle it, there’s nothing quite as sonorous as a big-inch V8 doing what it does best. Just because the Armada has throwback appeal doesn’t mean it’s light on driver-assistance tech. In addition to standard auto emergency braking and an intelligent forward-collision warning system added just this year, Platinum and Platinum Reserve trims also add systems for blind-spot and rear cross-traffic monitoring, intelligent blind-spot and backup intervention, and lane-departure warning and intervention. Just sayin'.